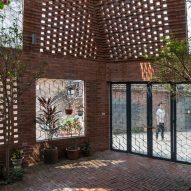 Two layers of perforated brickwork surround this two-bedroom family home in Hanoi by Vietnamese studio H&P Architects. 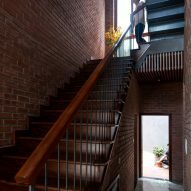 Brick Cave is located in a suburban area of the city that has undergone significant redevelopment in recent years. It is designed to make its residents feel like they are among nature, despite being in an urban environment. 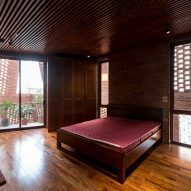 According to H&P Architects, "the structure of the house resembles that of a cave". 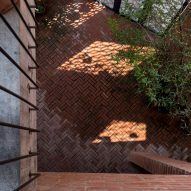 It is enclosed by two brick wall layers that meet each other at steep angles. 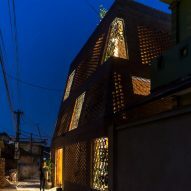 These are dotted with both small and large openings, to allow both light and air to penetrate the building. 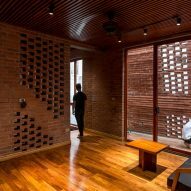 The two layers also act as a filter to keep bright sunshine, dust and noise out of the main living spaces while still allowing the elements – light, wind and rain – into other areas. 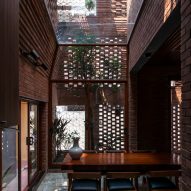 The double skin also creates an atrium-like threshold space. Indoor balconies project out into it, glazed rooms overlook it and plants grow inside it, sheltered from direct sunlight. 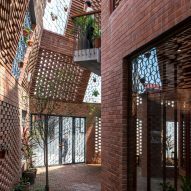 "Brick Cave encompasses a chain of spaces interconnected with one another, with random apertures gradually shifting from openness/publicity to closeness/privacy and vice versa," said the studio. 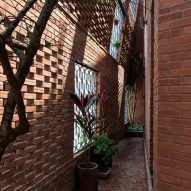 "The combination of 'close' and 'open' creates diverse relations with the surroundings and thus helps blur the boundaries between in and out, houses and streets, human and nature." 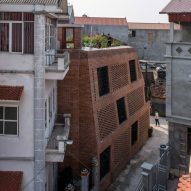 The 8.25-metre-high outer wall begins to angle inwards at around two metres up, reducing the house's overall volume and impact, and creating its angular shape. This tapered shape also helps to open up views of the surrounding area. 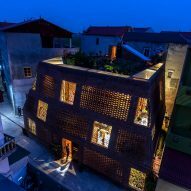 Principal architect Doan Thanh Ha told Dezeen that the idea was to work with typical local brickwork, but to use it in a completely new way. 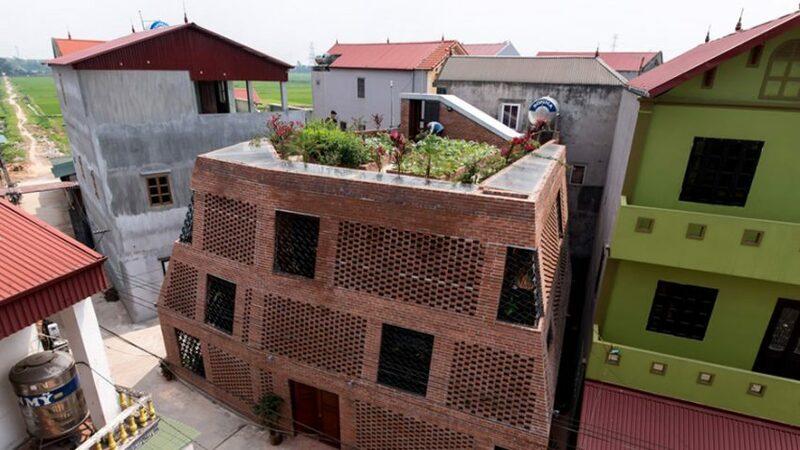 "As a material, bricks have commonly been used across Vietnam and are widely used both across rural areas and in the more built-up cities," he said. 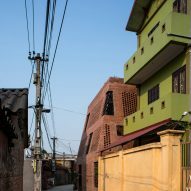 "Brick is familiar to local people but here it has been upgraded in terms of aesthetics and construction technique." 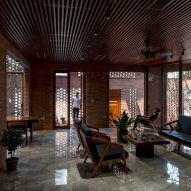 The house was built for a retired family who have moved back to the city to be close to ageing parents. The ground floor is largely open-plan, arranged around a courtyard. 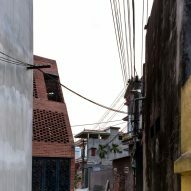 On this level, the large perforated openings create a connection with the street and a sense of openness. As you move up the building, they become smaller to give more privacy. Some of the rooms, including the dining spaces, also feature large skylights that reveal the full height of the building. 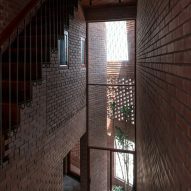 Timber window frames, ceilings, stairs and furniture contrast with the brick, which is carried through into the walls of the internal spaces. 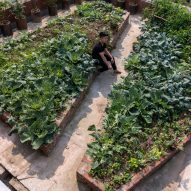 On the roof there is a planted garden, which reflects the vegetable garden which was on the site before the house was built. 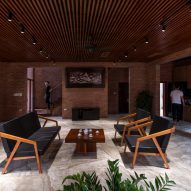 H&P Architects was founded by Doan Thanh Ha and partner Tran Ngoc Phuong. 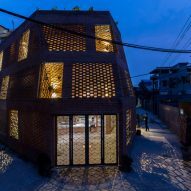 The practice has previously completed a prototype bamboo home designed to withstand floods in Vietnam. 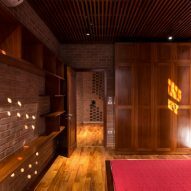 Brick Cave made the architecture longlist for Dezeen Awards in the house category.